When Can You Do Something With the Squash? I need my wheelbarrow back. Happily, winter squash is among the easiest harvests to manage. In this case it’s simply a matter of checking for blemishes or bugs, washing or brushing off garden dirt, and stashing the squash in a basket in the pantry. It will keep for months to come in a cool, dark, dry place. Squash with compromised skins (like critter bites) get cut up and cooked right away. The easiest way to do that is cut out the bad spot, cut the squash in half, scoop out the seeds, turn cut side down on a cookie sheet, and bake. Just bake until soft – about 45 minutes at 350 degrees – then scoop out the cooked squash, put it in containers, and freeze. Done and done. 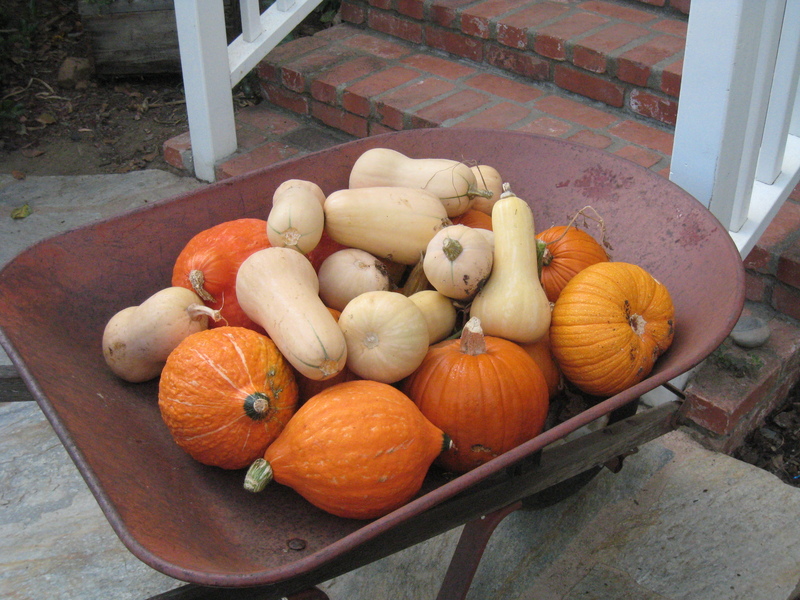 The wheelbarrow is back in service, and the squash is managed.